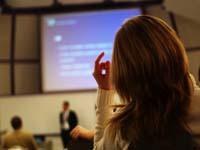 "Right Brain" & "Left Brain" have become popular modern business & career performance metaphors. "Right Brain Aerobics" is the "how to" training -- mental "exercises" that may be useful to increase creative, innovative thinking & tap "inner genius." We live in a time when the ability to think creatively and shift gears mentally with new techniques for innovative forward-thinking minds, may be crucial. This introduces Right Brain Thinking & Right Brain Aerobcs for Corporate & Institutional Training, Executive/HR/ Leadership Training as well as Public Classes. Try an Exercise! Try using for Right Brain Start Up to begin the day, before meetings -- watch the change in mental focus. --Dr. Craig Weiner, D.C., Creator, Transformational Dialogues & Host: Change Your Mind Radio Network! Email to Sign up for the RBA Tips Newsletter -- subject line "Subscribe to RBA Newsletter"
Worldwide Exclusive Distributor, Gallagher Management Company. 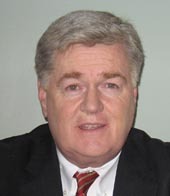 Contact Bill Gallagher, Pres., Gallagher Management Company & Author, New Pathways to Revenue: Right Brain Business Development -- 410-905-2055 or Email Bill Gallagher. Blogs & Quotes, Tips for increasing innovative, creative thinking. Experiences of Right Brain Aerobics Trainers. See also RBA's Right Brain Counseling Blogsite. Read Right Brain Blogs like Chapters of a Book! Articles/ video further describe Right Brain Aerobics. 1. Everett Herald (Exercises Focus on Right Side of Brain). 2. South Whidbey Record (Exercising the Right Brain for Crea-tivity). 3. New Connexion TV Interview with Sandra Rodman on the Right Brain Aerobics story. 4. Dr. Craig Weiner's Right Brain Aerobics video/articles. It may also be useful to read articles that discuss how "right brain" abilities such as creativity, innovation, intuition, meditation & deeper mental focus can have positive effects--are being sought more for career, business, and life skills. Key is practicing "right brain" mental exercises such as Right Brain Aerobics regularly & find out how this may be useful for you personally. Try a Right Brain Start Up! See Testimonials. You may find that doing these exercises daily can lead to useful Individual and Institutional Benefits. Training & "right brain-storming" sessions that can be useful to impact bottom line, personal effectiveness and performance in surprising ways. Right Brain Aerobics makes community contributions by offering Community Talks & Classes. 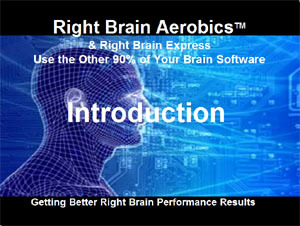 See Right Brain Aerobics Academy. 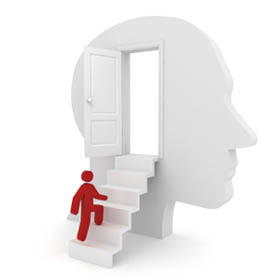 Would you like to manage and lead at more innovative levels with deeper insight? 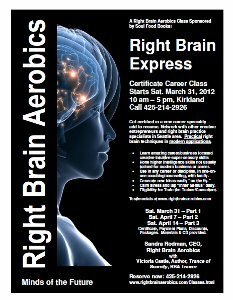 Would you like a company or career differentiator -- adding Innovation & Creativity & a Right Brain Aerobics Certificate to your skills list? Would you like to become a "thought leader" with surprisingly easy and practical new techniques to use daily? Would you like to problem-solve & brainstorm much more effectively with easy techniques to generate new ideas "one the fly"? 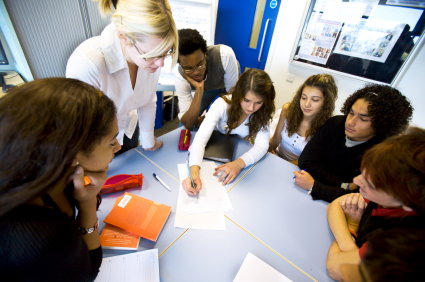 Would you like to teach and learn at higher intelligence levels using the mind differently? Would you like to explore new career dimensions? Would you like to start new projects, onboard executives, resolve conflicts more creatively? Would you like new techniques to get "unstuck" with almost any kind of problem from science and technology to parenting and dating? Would you like to tap "inner creative wisdom" and act as your own "super coach" in surprising ways? Would you like to calm the mind in deep sound and processes, reduce daily stress in new ways? Would you like to understand "right brain languaging " to learn to use RBA for better left brain productivity and analysis? 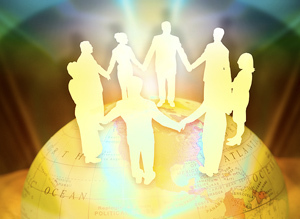 Would you like to explore more "multidimensional" creative intelligence? 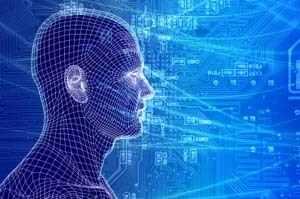 Would you like to learn techniques to fire up right brain "ah hah" moments, innovative thinking, strategic & critical thinking as personal practice. Would you like to learn career skills rarely trained in business or education -- to make a real difference in your organization or community? Would you like to help your organization become more creative at every level! Productivity isn't really "productive" -- if you keep executing old ideas and missing long-range shifts. New insight and "ah hah" brain thinking can save eons of repeating old "to do lists" -- and old "bottom lines." Redefine your own success. "All too often we are stuffing the heads of the young with the products of earlier innovations rather than teaching them to be innovative. We treat their minds as storehouses to be filled rather than as instruments to be used..."
Calendar for Community Classes, TeleConferences, Public Talks by Right Brain Aerobics Trainers: At Right Brain Aerobics Academy Calendar. 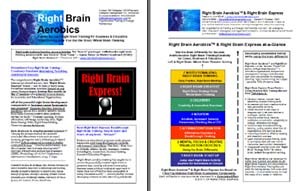 Newsletter: Email Sandra Rodman to sign up for Right Brain Tips Newsletter! For Corporate & Institutional Training & Classes, contact Bill Gallagher, Gallagher Management Company, 410-905-2055 or Email Bill Gallagher. Can you change mental ability and become more creative for any career at any age? in as little as 8 weeks. Has Creativity Declined significantly since 1944? Why? We find this an interesting article. We've all becoming highly skilled with left brain ability -- and this article suggests that perhaps some of our creativity skills could use some honing! Article from the IEEE (Institute of Electronics and Electrical Engineers), Proceedings of the Seventh International Conference on Information Visualization, 2003, “Creative performance: does the computer retard artistic development?,” T. Kipp. “Over the last decade, there have been several debates concerning the dominance of technology in academic disciplines such as fine arts and graphic design. Advanced imaging devices, such as fMRI and PET scans, have provided researchers with visual information in the field of brain science that may settle these debates. We outline a research study conducted among undergraduate art students to investigate the level of visual perception and creative development. 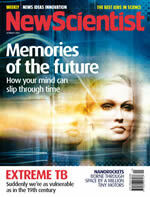 .."
What if right brain skills had been elevated 80% compared to 1944, instead of declining by 80%? Who might we be and what might we have created? "Activating the other 90% of the brain may be like activating a much richer, vaster, different LIFE than we have imagined possible..."
>> Sandra Rodman & Dr. Craig Weiner, Right Brain Aerobics, profiled in the Everett Herald: "Execise Course Focuses on Right Side of Brain"
>> Sandra Rodman & Victoria Castle featured in South Whidbey Record "Exercizing the Right Brain for Creativity." What Are People Saying about Right Brain Aerobics and Sandra Rodman? g? has been designed to enable anyone to open the Right side of their brain, no matter how great a 'Lefty' they think they might be. The possibilities of this work are endless. The practices are both simple and powerful and can be used in any circumstance to create a deeper and more profound experience." -- Craig Weiner, D.C., Creator of Transformational Dialogues, Host, Change Your Mind Radio & Director, The Chiropractic Zone. See Dr. Craigs blogs commentary on using Right Brain Aerobics: "Teaching Impossible Things: A Right Brainy Kind of Day" and "Unexpected Results When Beginning transformational Dialogues with Right Brain Start Up"
"With Right Brain Aerobics my conscious limitations dissolve into an expanded sense of freedom. Thought is effortless, boundless. I have access beyond my ordinary limits. I highly recommend it!" "With Right Brain Aerobics, the inner genius of each individual as well as the collective genius of everyone in the organization will surprise and delight with amazing ideas and dreams previously thought impossible. Brainstorming sessions have resulted in samplings of how ping-ponging off each other’s ideas takes teams to higher places faster." -- Maya Hennessey, Maya Hennessey & Associates. Named by Counselor Magazine as one of the top 60 woman making a difference. "Sandra Rodman & Right Brain Aerobics have just been absolutely fabulous! Very instrumental & helpful in changing & moving on in whatever direction I choose to!" Jody Bone, Gallery & Museum Glass Artist & Children's Book Author, "The Little House that Grew" -- Bulding Your Dreams! "It is remarkable to observe your out-of-the-box creative thought processes. You connect seemingly unrelated elements, then formulate wonderfully unconventional plans of action. You are always amazing! A synaptic wonder!" For Right Brain Aerobics Classes, Talks, Speaking Engagements -- Contact Sandra H. Rodman, 425-214-2926, Right Brain Aerobics, Email Sandra. For Right Brain Aerobics Corporate and Institutional Training call Bill Gallagher, Gallagher Management Company: 410-905-2055. *Affirmation Exercise component was adapted from that created by the Strategic Learning Systems Method, used with permission. 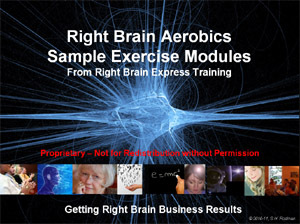 Right Brain Aerobics for Business, Career, Educational and Personal Advancement, Corporate and Institutional Training. Combining 7 Training Components for a new competitive edge - meditation, intuition, creativity, affirmation-cognition, strategy. Created by Sandra Hudlow Rodman. Home- | -Classes- | -Articles- | -About/Contact- | -Corporate Training- | -Benefits- | -Trainers- | -Gallagher Co.